Top handle satchel handbags for women featuring the Tommy Hilfiger women signature flag stripe and gold TH hardware. Double top handles and removable convertible strap with gold hardware details. Flat bottom, top zip closure. Lined nylon interior with wall zip pocket and slip pocket. This Tommy Hilfiger bag is a versatile essential, perfect for your next work bag. Our timeless Tommy Hilfiger handbag is a stylish addition to your collection of top handle handbags. 13-3/4" length; 8-1/2" height; 5-1/2" width; 3-3/4 23-1/2" drop. 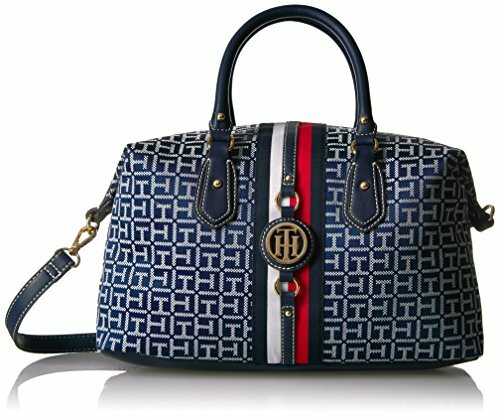 Top handle satchel handbags for women featuring the Tommy Hilfiger women signature flag stripe and gold TH hardware. Double top handles and removable convertible strap with gold hardware details. Flat bottom, top zip closure. This Tommy Hilfiger bag is a versatile essential, perfect for your next work bag. Our timeless Tommy Hilfiger handbag is a stylish addition to your collection of top handle handbags. 13-3/4" length; 8-1/2" height; 5-1/2" width; 3-3/4 or 23-1/2" drop with convertible strap.